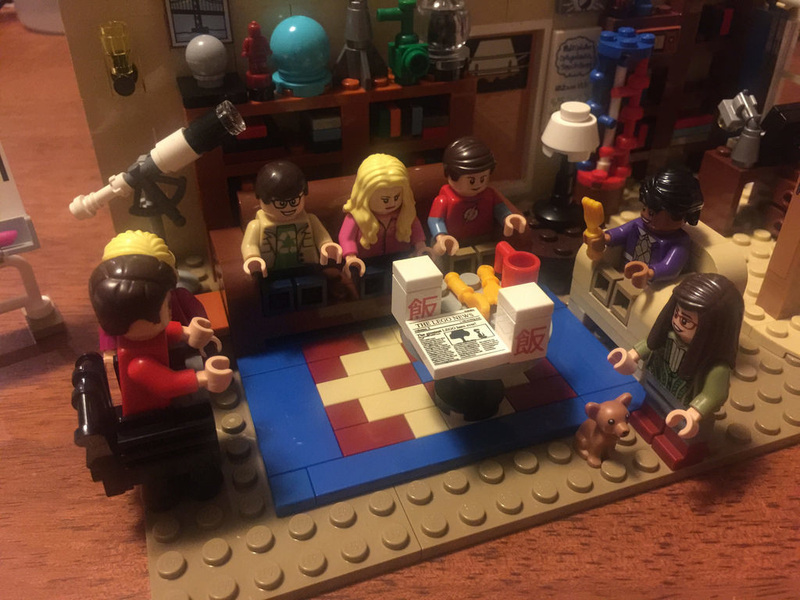 ​The Big Bang Theory is a great show, and one of my favourites on TV. Some love it, some hate it as it makes fun of nerd culture, but the same goes with the LEGO Ideas theme. Some (like me) love it as it injects a wide variety of sets to the market. Others hate it as it’s become either too commercialised, with franchises and existing brands dominating the approval lists, while possibly ignoring the little guys. 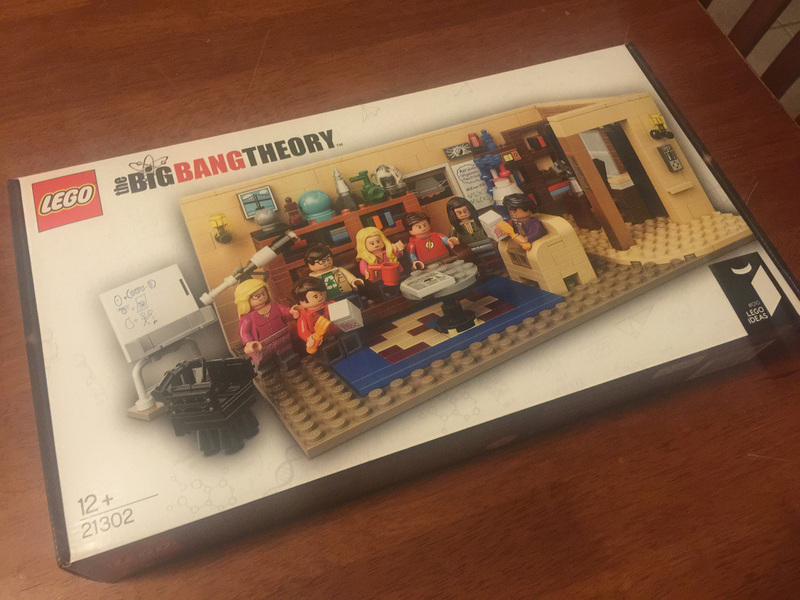 Regardless of this though, The Big Bang Theory set is here, and it’s got plenty of detail! 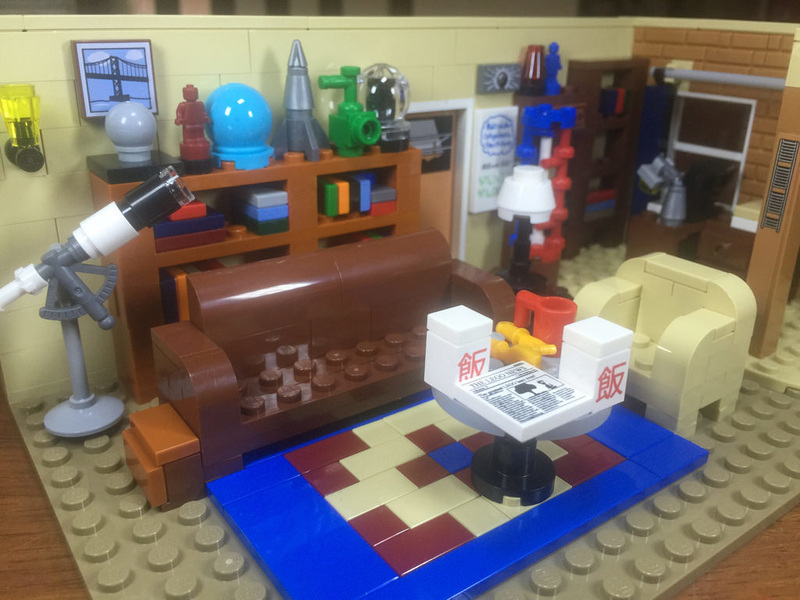 The original project was submitted by Alatariel, who is well known in the LEGO Ideas sphere as also being responsible for 21110: Research Institute. You can read my review of that set here. While the basic structure of the set has not changed from the original submission, many of the details have. The back wall’s colour has changed, as well as some details on the shelves, but for the most part, it’s all pretty true to the original, with some changes being totally understandable. 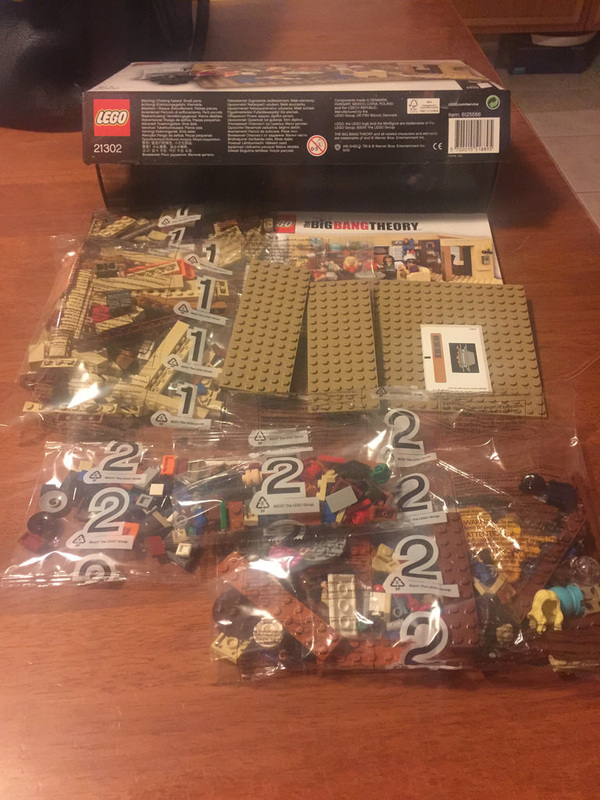 Inside the box you will get three loose dark sand plates, an instruction booklet, a small sticker sheet, and 5 bags of parts. This set is chock full of element goodness. Thanks to the detailing in the apartment, we’re given loads of small parts, fine detailing, and in a fair few cases, some brand new elements here as well. Of course, the minifigures are all new, but I’ll come back to them. We’ve got new blue and dark red nanofigure, a dark green tap, plenty of printed parts including some whiteboards with scribbles on them and an old school radio, a medium azure globe and two chinese takeout boxes (I wouldn’t mind a few more of these). There’s also elements that we’ve seen in sets before but are brilliant to have – a chihuahua (for Raj’s dog Cinnamon), some markers that are actually lipstick, and a whole kitchen accessories pack. These are great, but a little out of scale, and with them all in yellow, it’s a pity, but you get some pretty great spares. ​The minifigures, however, are the clear stars of the set, as they’re the stars of the show! Hilariously enough, the original submission for Bernadette had the kid sized legs! It’s good to see that she’s been given an upgrade to adult sized legs. 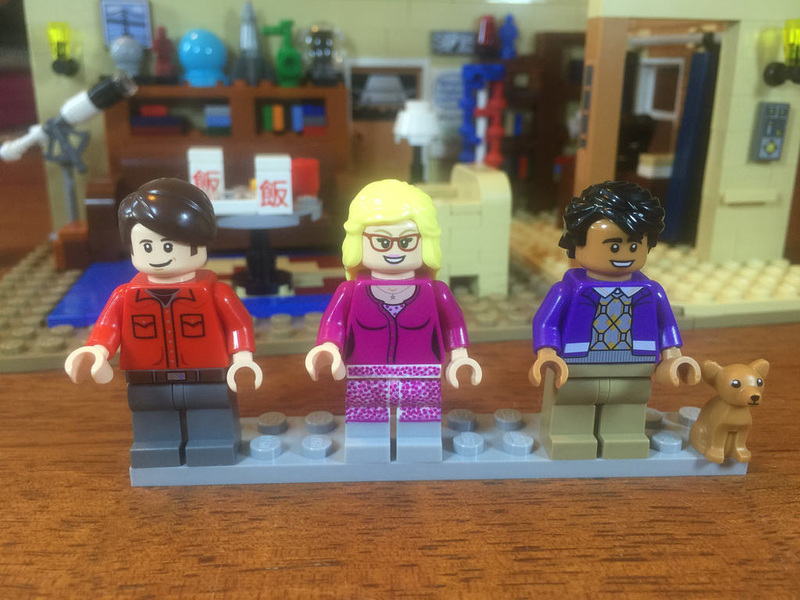 All minifigures are brilliantly detailed, and instantly recognisable to fans of the show. The two toned arms on Sheldon are excellent, first seen in the Simpsons sets. His Flash shirt and alternate creepy smile are also spot on. Leonard has his recycle tee on, and an alternate pout is great – most likely reacting to something Sheldon has said. Howard probably has to be one of the two best ones, with his printed game controller belt buckle and red shirt with black turtleneck. Raj is my favourite – he’s perfectly recreated from hair to feet, and his alternate face is reminiscent of the first seasons with his selective mutism around women. On to the women! Penny is a little standard. This minifigure has been seen before, I’m sure of it. The perplexed alternate expression is great though. Bernadette is perfectly captured, and it’s great to see that she’s been given full sized legs! In the original submission, she’s got kid legs! Hilarious, but pretty rough for her. Finally, there’s Amy. 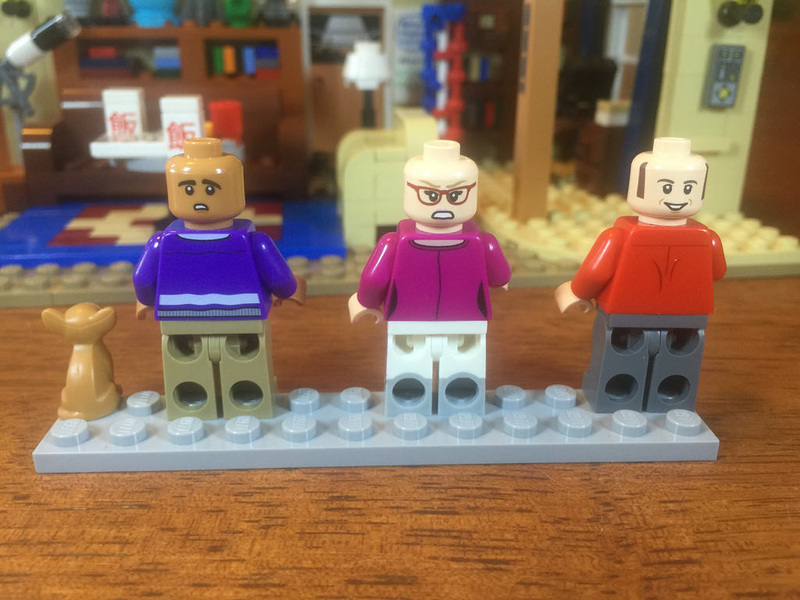 This is another one that’s really well done – with the hair from the CMFs Librarian minifigure, she’s a great addition, especially with two-toned legs. 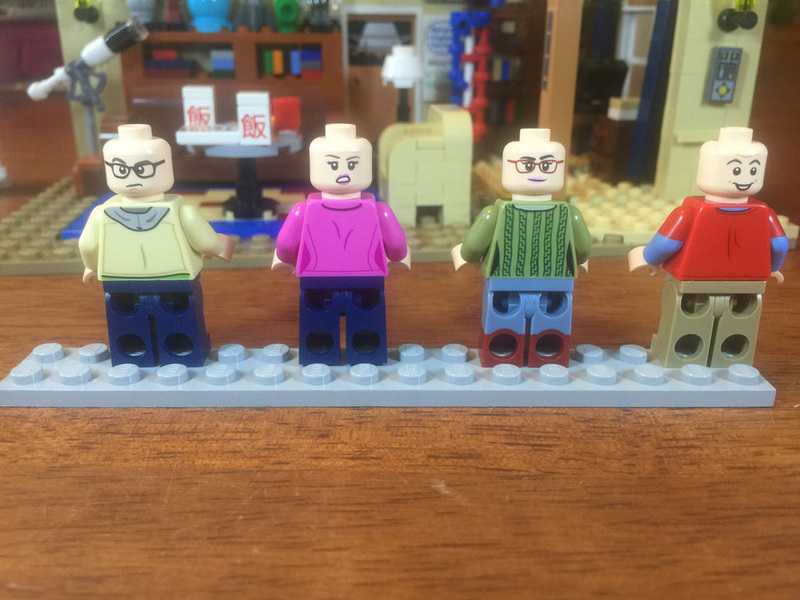 All minifigures have back printing which add to the brilliantness. 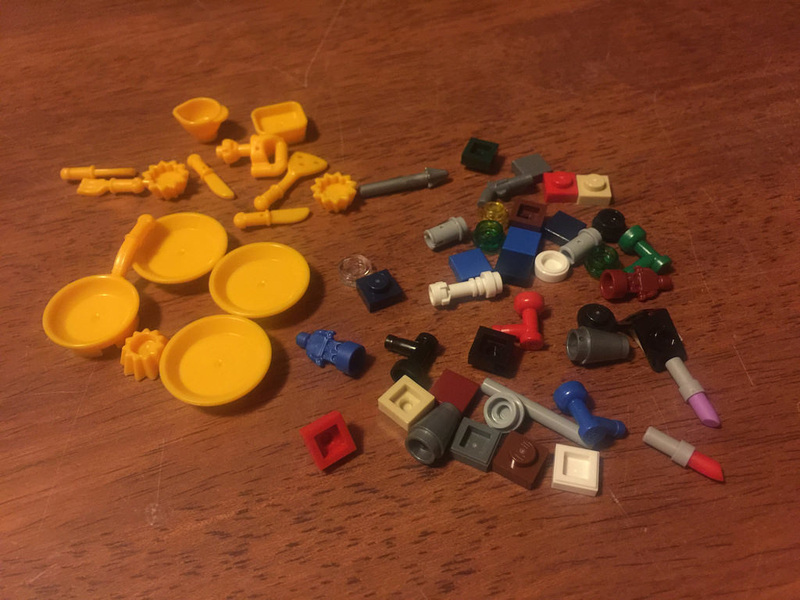 ​I got some pretty insane spares with this set. 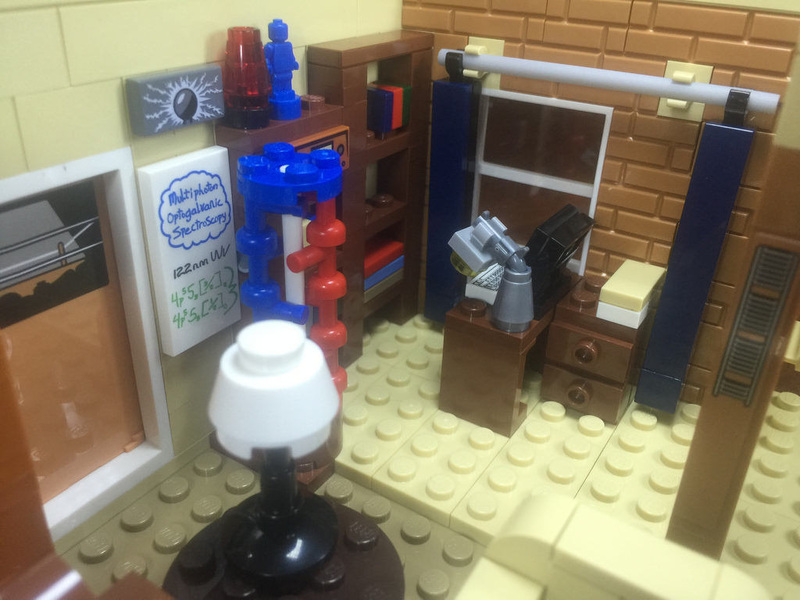 Aside from the usual stuff, there’s a harpoon, minifigure pistol (brilliantly used in the desk lamp), two nanofigures, the lipsticks, three taps, and of course all the kitchen stuff. I had to do a quick run through the instructions again to make sure I hadn’t missed anything! I’m going to go with a 7 for this one. While you can of course recreate some scenes in the show, there’s not much else you can do with it. Recreating scenes is still great fun, so maybe this section should get higher, but to me, this is purely a display set. It was pretty great fun to piece the room together. Starting with the back wall and study corner the shelves go in, and get filled up with books, followed by the main bookcase, rug, seating and the rest. It’s pretty fiddly, with so many small elements, but is still fun to build, as there’s so much to look at. I really like the couch. It’s simply built, but so effective. The design of this set is excellent. 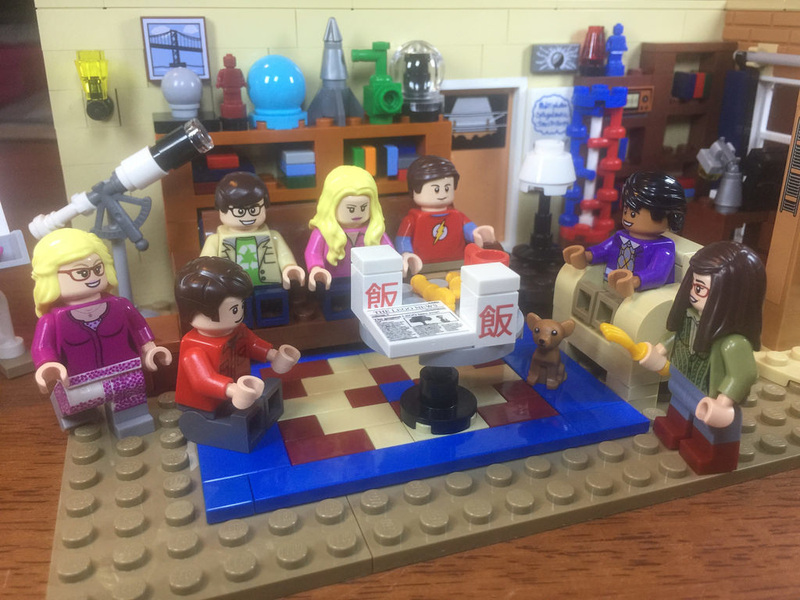 There are so many details that hark back to the show, like the Green Lantern lamp, chinese takeout boxes, thermostat, and more. It’s brilliantly done. I also particularly like the curtains. They’re something I had no idea was even in the set, but oddly enough, it’s one of my favourite parts of the build. The one I’m most disappointed about has got to be the DNA model. The original submission’s version looks fantastic, with the hoses being used to curl around the central spire. The official LEGO version uses blue and red taps, and they don’t really curve in the same way. It just doesn’t look right to me. 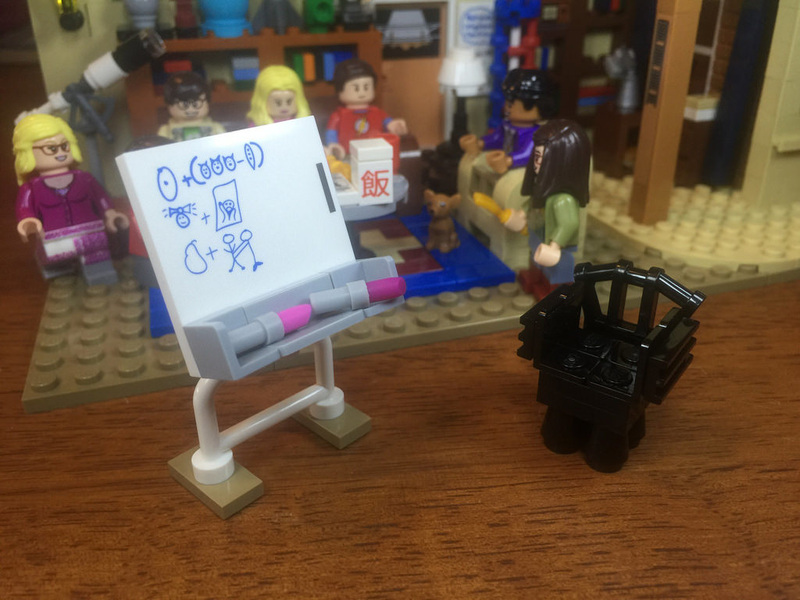 The extra parts like the chair and the whiteboard are also excellent, although there’s not many places to store then in the set. The interesting thing about LEGO Ideas sets is that they’re all so individual. You can easily skip a set if you’re not a fan, or collect them all for the fun of it. There are some set though, that just need to be grabbed if you’re a fan of the IP itself, and this is one of those sets. 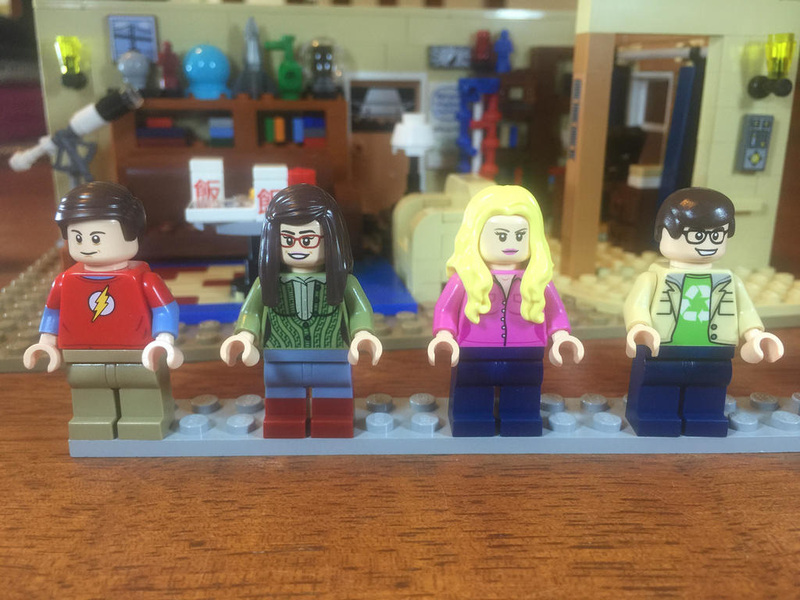 If you’re a fan of TBBT, you’ll want to get this set while you can. Like many Ideas sets, they run out pretty quickly! Value for money is pretty decent at the moment. You can spend pretty close to the RRP and get your hands on one in the secondary market, but it’s still available in stores and online, so go there. The price you pay is fantastic for the parts you get, so that in and of itself is worth it. Next week we’re heading back into the bulk lot, with a Star Wars set – 7259: ARC-170 Fighter. Bring it on!